What would you do to live forever? Would you bathe in the blood of innocents? Would you steal the body of a younger man or woman? Could you drive the impurities from your soul? And is eternal life worth the cost? • A detailed examination of three types of immortal: the murderous blood bathers, the horrifying body thieves, and the exotic purified. • Detailed rules so that players can create any of the above types of immortal beings. • Numerous immortal antagonists and allies suitable for use in almost any chronicle. 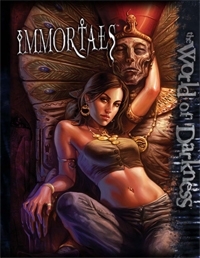 • A selection of others rare and unique immortals that Storytellers can use for both mortal and supernatural chronicles. This title was added to our catalog on May 18, 2009.